Did President Akuffo-Addo Win Power To Make NDC Rich? 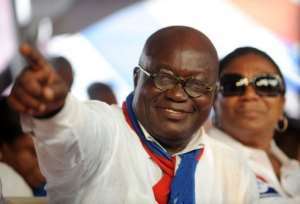 President Akuffo Addo will have a hard time convincing the party and in particular its members and financiers to support him for a second term bid if he does not do something about the way and manner appointed Ministers, Deputy Ministers and chief executives are giving all the juicy contracts to members of the NDC. The NDC may be in opposition but their members are enjoying the trappings of power and majority even do not regret that their party was voted out of office. All over the country, the DCEs and MCEs prefer to give contracts and opportunities to the opposition as they are well resourced and ready to pay small commissions and fees. Constituency executives are suffering. When these appointees are confronted, they claim they have the backing of the President and the Chief of Staff to do what they do. Day in day out businessmen and women who were aligned to the NDC continue to be awarded juicy contracts in the Ministries of Roads and Highways, Special Development Initiatives, Energy and Petroleum, Housing, Agriculture, and Mining. The Roads sector is virtually controlled by NDC with The likes of Abbas at Ghana Highway Authority enjoying the blessings and protection of the Roads Minister Kwesi Amoako Atta who has virtually become an NDC member, dishing out contracts to NDC contractors who owe the Ministry huge sums of money yet still get contracts. It is a sad spectacle to see NPP foot soldiers, volunteers and grassroots supporters sitting at home without any job prospects and expected to defend and project the party! The NDC does not need John Mahama to come back. They are in power though in opposition. The New NDC are the ministers and government appointees appointed by the President who pretends to be NPP but are really NDC supporters and sympathisers at heart and enemies of the party. The NDC controls 80% of all government procurement. They call the shots in President Akuffo Addo’s government thanks to the wonderful policy of keeping NDC appointees at post at Ministries, Departments and Agencies. Very soon this President and his cronies in Accra will come again in their convoys and Party T- Shirts and ask us to go into the bush with them to campaign because we are fools and sand runs through our bodies. Never again will we allow anybody to come and deceive us they want to be President only to come and do backroom deals with NDC and enrich them.